Who wouldn’t want to wake up to this on a Monday morning? But first, there was a workout. Monday is my cross-training day, so cross-training I did. I have an evening meeting tonight, so the only way to get in a workout before work, required that I get up at 4:30. That is such a repulsive hour to get up, but every once in a while will not kill me. So I got up at 4:30 am, threw on my workout clothes and was downstairs by 4:45 am. I hopped on the elliptical for a thirty minute session on level 10. Just before 5 am, one of the concierges walks in to turn on the TVs and to remind me (for the second time) that the gym does not open until 5 am. And for the second time I nicely said that I have no other time to workout, which is why I’m in the gym so early. I really don’t see what the big deal is if I get to the gym a little early. We pay HOA fees to fund the gym and he is the only concierge that ever points out what time it is, although he’s not the only one who has caught me in the gym early. This time, I told him I was getting a new job so I wouldn’t be working out before 5 am in the near future. After my reprimand and my elliptical session, I did a quick circuit repeating two times, which took about 15 minutes. Whew! Jump squats, or any other plyometric move for that matter, will get your heart racing! Now, back to breakfast. 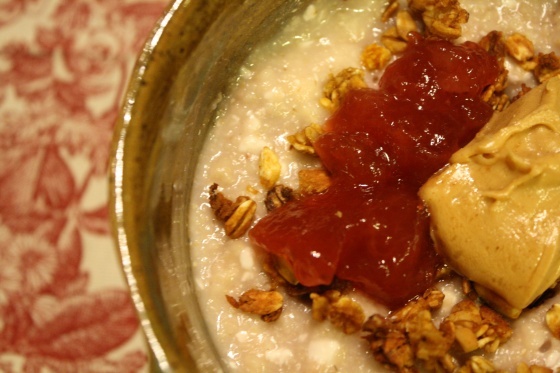 In this lovely bowl, I ate strawberry cottage cheese oat bran with a not-so-secret ingredient. 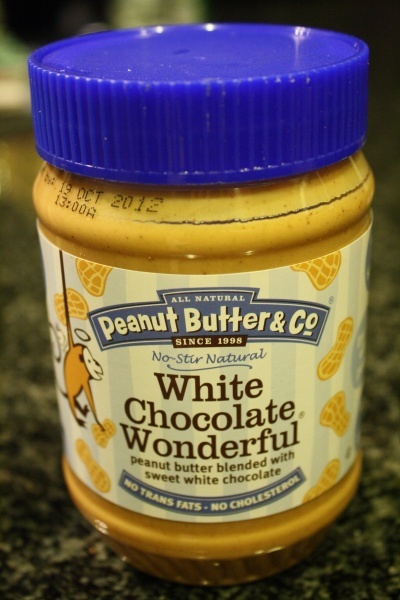 White Chocolate Wonderful. And wonderful it is. 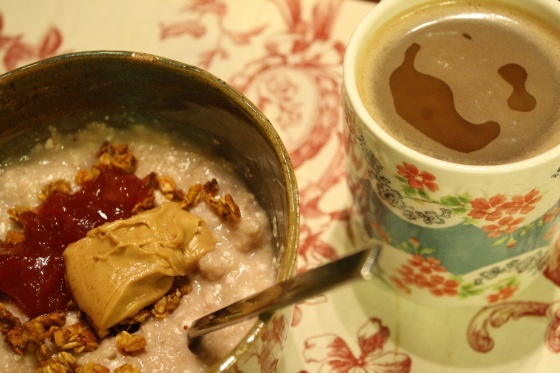 Toppings: about 1 Tbsp of each – strawberry jam, White Chocolate Wonderful, and almond crunch granola. 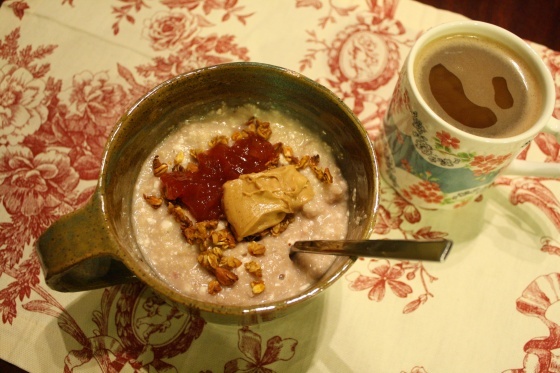 One of the best bowl of oats I’ve had in a while, but the sweetness of the peanut butter meant that I probably could have done without the strawberry jam. However, I’m not complaining, this oat bran was DE-licious. Now onto my last giveaway for Coconut Giveaway Month. This week’s giveaway involves coconut, but it’s not a food product. Can you believe it? It’s Tropical Traditions Virgin Coconut Oil Hair Treatment! You can read all about it on their website, how they have tested it, how it’s an age-old replenishing hair product in South Asia, but let me tell you why I love this stuff and why I need this stuff. My hair is super duper dry. When I joke about not having washed my hair for days, I’m really not joking. When I use styling products and styling tools day after day, my hair gets damaged and brittle. So I often let my hair use its natural oils to replenish itself by not washing it. I’ve been using this jar of coconut oil at least once a week for a month because I would never giveaway something here that I hadn’t used or something I do not like. I wanted to test it out first to see if it was as good as Tropical Traditions says that it is. Use it sparingly – While I typically glob conditioner on my hair and use the same size bottle twice as fast as shampoo, I only need a teaspoon or two of this to really feel and see a difference. Experiment with the best way to use this product – There are suggested uses on the back of the jar, but I learned that I like to use it just before shampooing. It’s virtually impossible to get it out of my hair without using a cleanser like shampoo, so I put it on when I first get in the shower, then wash it out. I have also tried shampooing, using it, then rinsing it out with water. My hair looks pretty greasy after it’s dry, so I wear it up that day. Don’t be afraid to wear your hair up one day to allow it to really work – Once I completely washed it out later, my hair felt amazing. So if you like to wear your hair up, rinse it out with water which doesn’t really get it out of your hair, but allows it to continue to replenish your tresses until you wash it out with shampoo. I’m going to love using this stuff this summer, which tends to be brutal on my hair. Don’t ya wanna win some? 1st Entry: Leave a comment telling me your most troublesome hair issues. 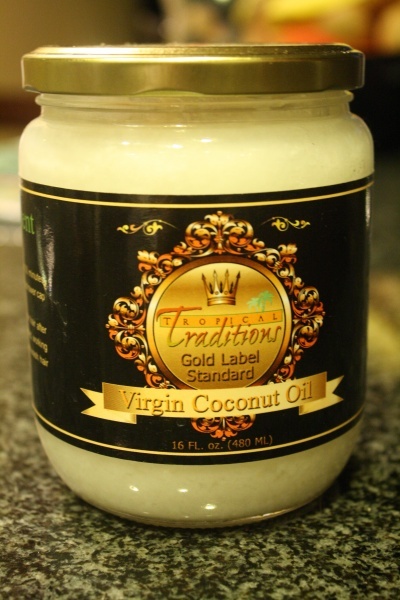 2nd entry – Tweet “@Foodiefresh is giving away @TropTraditions Coconut Oil Hair Treatment! #giveaway http://foodiefresh.com” and tell me you tweeted in the comments. It’s both. 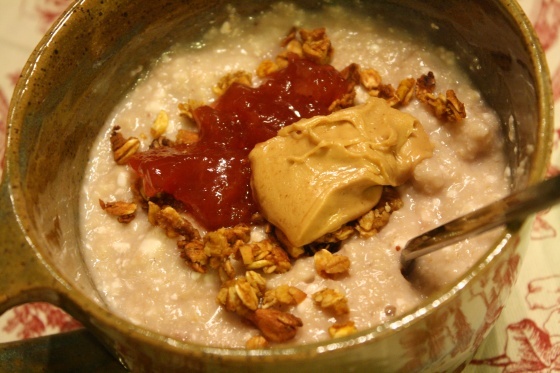 I put frozen strawberries in my oats and then I topped it with strawberry jam. It’s delicious! If your hair is dry, you may want to try washing your hair with “conditioner only.” It works wonders! Here’s hw to do it: you get a goey, drippy, runny, cheap conditioner (My favorite is Vanilla Mint Tea Conditioner by V05), and a shower cap. Gloop on the conditioner and put on the shower cap as soon as you enter the shower. Then do whatever else you do in the shower (wash, shave, relax)…then comb it thru with a wide tooth comb, rinse it all out and exit the showe. My hair loves it and hates shampoo!!! hmmm….2 pounds of coconut…maybe some coconut blondies, maybe some sorbet? coconut fried shrimp? Amy, I’m so sorry. This giveaway isn’t for 2 pounds of coconut. That was last week’s giveaway. This week is Virgin Coconut Oil Hair Treatment. My computer ate this post the first time I typed it up so I was probably a little sloppy the second time around. I apologize for that. No problem! My hair troubles are my crazy flyaways-my husband says they make me look homeless! Doesn’t sound unhealthy to me. Have you tried pea sprouts which are different than sprouted peas? I love them! And they seem to keep longer in the fridge than regular sprouts. My hair seems to be extremely dry once I add highlights to it, but I really adore the way a lighter shade looks…maybe that coconut treatment would help! oh.My.GOODNESS! I would looooove to win this stuff! I have the same problem as you… very (very) dry tresses… and I also try to not wash it but a few times a week so that the natural oils can do their thing. I think i’d totally benefit from something like this!!!! Ah this makes me excited to try it out! Also, no one in their right mind should reprimand you for working out so early like that… that takes motivation!!!! Troublesome hair — the story of my life! I have naturally wavy/curly hair and depending on the weather it can become insanely curly! I’m always on the search for a new product that will tame it a bit but allow it to curl naturally. And, as with most curly-haired girls, my hair can be super dry. My hair trouble is that my hair never wants to cooperate without a lot of effort (mostly heat styling! ), so this would be pretty awesome since it gets so damaged with all the blow drying and curling!